"The Prime Minister who has Passed his Prime 迟暮的丞相 (chí mù dè chéng xiàng)"
The old man gets a face lift with this stunning new portrait picture. Can't say the same about his abilities though, since they are largely untouched. In case you do not know who Zhuge Liang is, he is arguably the most hyped up, exaggerated, and worshipped figure in all of ROTK folklore. The man undeniably responsible for the rise and success of Shu Kingdom, he was the advisor to Liu Bei 刘备, and became prime minister after Liu Bei's death. For some strange reason, this character has become more appealing in Kingdom Wars. Maybe it's how he gels with some of the new rules. Or maybe its just because the portrait is more appealing? At the beginning phase of your turn, you can view X cards from the top of the deck (X being the number of players still alive in the game, and cannot exceed 5). Place any number of these cards, in any order, on the top of the deck . Place the remaining cards, in any order, at the bottom of the deck . An ATTACK 杀 or DUEL 决斗 will be cancelled if you have become the target and you have no cards on-hand. The ability description for "Empty City" has been changed from “cannot become the target of... ” to “... will be cancelled”. What this means is that you can now target Zhuge Liang and use ATTACK or DUEL on him even if he has no on-hand cards. The ATTACK or DUEL card is simply wasted and has no effect on him. One advantage of this you have one more way to reduce your on-hand cards, especially when you cannot discard anymore cards in your discard phase. This is good in scenarios such as bringing your on-hand cards low enough to avoid Huang Zhong 黄忠's ability, etc. There are many ways to use this to your advantage. Get creative! In Romance of the Three Kingdoms, Zhuge Liang is given almost god-like powers that can predict the changes in weather, accurate to within the day that wind directions change. He is able to make these predictions from his knowledge of reading the stars, thus the game ability to "predict" what cards are coming up next with his "Star Gazing" ability. Ok so its outright manipulation of the cards coming up next, but heck might as well dramatize it more! The "Empty City" ability comes from the famous ploy he uses to fool Sima Yi司马懿. As all his troops have been sent out in missions, he was unable to defend himself from Sima Yi's attack of his current location (Xi Cheng 西城). In classical reverse psychology, Zhuge Liang empties the city, opens the city gates wide to welcome the invaders, and calmly plays the zither atop the gate in full view of the enemy. Sima Yi suspects an ambush and thus retreats. 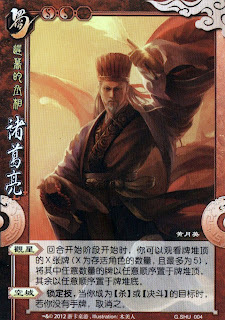 To replicate that effect, the game makers gave the player using Elder Zhuge Liang unsusceptibility to ATTACK and DUEL when the player has no more cards left to defend himself or herself.